Conference "A new architecture for investments in infrastructure in Brazil"
FOR PRESENTATIONS, PDFS AND OTHER INFORMATION ABOUT THE EVENT. CLICK HERE . 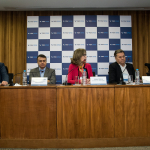 On the occasion of the launch of the new series of researches in Infrastructure Engineering, FGV CERI and FGV EPGE promote the Seminar "A new architecture for investments in infrastructure in Brazil". The event will bring together a list of experts for the redefinition of public and private investment markets for the promotion of investments and modernization of infrastructure in Brazil.